Dairy-free, gluten free, sugar free, fat free, and the list just keeps on going. If you haven’t noticed already, people love to be free, from nutrients that is. The dairy-free always boggles my mind because I feel like it is more of a trend, then an allergy issue. I remember watching a weight loss TV show that focused on incorporating exercise and diet to help people lose weight and get revenge on a person, or their old self. As I cringed with the whole premise of the show, I was even more angered at the doctor/registered dietitian who placed the contestants on a restricted diet. He urged them to cut out all sugar and dairy, along with gluten and other inflammatory markers that, according to him, “contribute to weight gain.” There are a lot of areas that need to be debunked from that statement. First, associating a number on a scale with health status of the person, is unethical. Research has shown that weight does not always contribute to chronic disease. I could go on and on about this but I will save it for another blog post. Second, everyone is different. Therefore, everyone’s metabolism is different. What may work for some people, may not work for others. Third, what is wrong with dairy? Dairy provides the body with calcium, potassium, phosphorous, protein, vitamins A, B12, riboflavin, and niacin. Vitamin D may, also, be provided within some milks and yogurts. Therefore, eliminating dairy, eliminates a plethora of vitamins and minerals. So, you can see why this show angered me. Instead of restricting yourself to a certain diet, it’s important to incorporate all foods within your diet, to ensure a balance of vital minerals and nutrients. Brianna with her sister, Brooke, at their cousin’s wedding this past summer. What got you into nutrition? BS: Health and nutrition have always been a big part of my life. 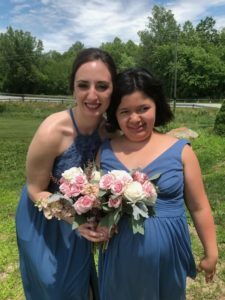 Growing up, my younger sister was diagnosed with autism, several food allergies, and digestive issues. I was always immersed in helping my parents cook and problem-solve for her many nutritional needs, but my love for nutrition was not solidified until I was in my late years of high school, when I developed a great deal of digestive problems myself. After changing my eating habits and restoring my health, I realized that I had a passion for nutrition. What area of nutrition do you want to focus on? BS: I hope to focus on working with kids with digestive problems and allergies. This is something that is very close to my heart. With my vast knowledge and experience in this area, I hope to help people who are suffering from similar situations as myself and my family. What is a common thing people ask or say to you when you tell them that you are in the process of becoming a registered dietitian? BS: The most common thing I hear when I tell people that I am in the process of becoming a registered dietitian is that they really want to pick up brain on my opinion of the newest diet trends and what we are learning in school in comparison to them. It is nice to have people see my education and career choice as a reputable source of information and I hope to help people find what works best to promote their health. Want to learn more about dairy? Come to the lunch talk hosted by the Employee Assistance Program (EAP) 12-1 p.m., Wednesday, November 7th. Register for this event to learn the location on campus.